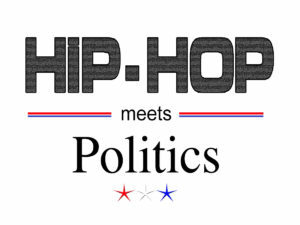 “Hip-Hop Meets Politics” is a political movement which is being represented and led by Robert Strawder aka “Tha Vegas Don” under the auspices of the Libertarian Party of Nevada. 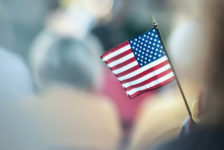 This political movement was envisioned by Yvonne Rainey also a member of the Libertarian Party of Nevada who along with Robert Strawder is currently establishing the Black Caucus of the Libertarian Party. which was truly the birth and the rise of a new Nation who demands the liberation of all people, who have been socially disenfranchised here in America. We believe with the influence of Hip-Hop along with Libertarian beliefs and policies we are embarking on a new generation of people who are willing to speak not just musically but verbally on any political platform until our community voices are not only heard but respected across the entire globe. We give thanks and honor to all of the founding fathers and pioneers from past and current Hip-Hop Artist for being that earsplitting, bass pounding, voice of power who spoke raw and uncut, without any filters about our community’s social and political issues. The Hip-Hop Community brought the concept of “Keeping it Real” and teaching our communities about the “Real Time” we were facing in our urban and inner city communities. They woke us up musically/lyrically by executing their Constitutional first amendment rights which is a “Freedom of Speech” by using every foul, explicit, word of expression to describe the deplorable conditions our family and friends were living in to survive the urban warfare that many of us was born into. This movement is our way of acknowledging and honoring the Hip-Hop community for their courageous acts of speaking out to the powers that be against, oppression, depression which led to a drug filled, crime ridden war zone in every inner-city, and urban neighborhood across the United States of America. This movement is our salute to Hip-Hop by acknowledging artist like Kurtis Blow, African Bambaataa, Public Enemy, KRS-1, Professor Griff and the Boogie Down Productions, Ice T, NWA, Ice Cube, 2 Live Crew, Shock G, Tupac, Tribe Called Quest, Lauryn Hill, MC Lyte, Slick Rick, Queen Latifah, Dead Prez, Askari X, Too Short, E-40, Big Mike, Big K.R.I.T. more current Jay-Z, Kanye West, Nas, Kendrick Lamar, this is just a short list of names but definitely doesn’t represent even a half of the Hip-Hop community who has made great contributions towards bringing awareness of our quest towards liberty, freedom, equality and justice for all. This movement is also a battle cry to the Hip-Hop community to align with us in the Libertarian Party and Robert Strawder’s movement in assisting us in bringing in this new era of change. Starting with the end of a two party broken system that has not been able to bring about the change in which, “We The People” have been striving, begging and seeking for hundreds of year and still in pursuit. 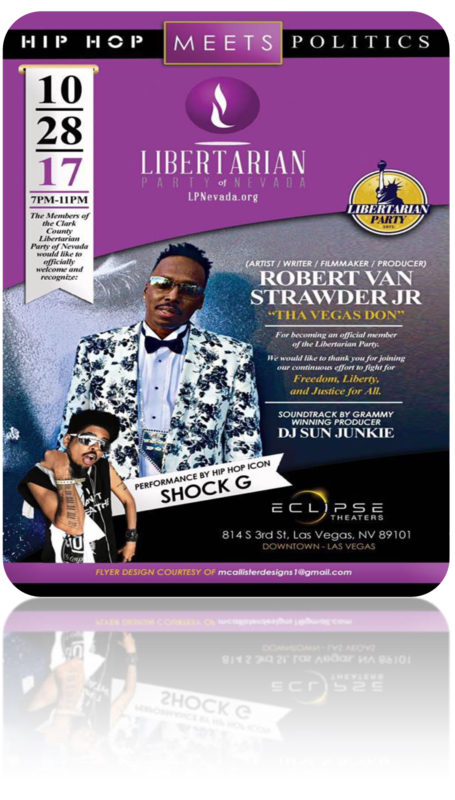 We believe through the alignment of the Libertarian Party and its values/beliefs infused with the powerful voice of Hip-Hop led by Robert Strawder, “Tha Vegas Don” we will start to see a drastic measure of change by 2020, an ironic number representing perfect vision. Let’s all unite by voting Robert Strawder for US Congress and let’s inspire other voices of the Hip-Hop Community to take this trend to every city, and hood across America and let’s rally the voice of the People so we can all be a part of the quest of Making America Great Again.